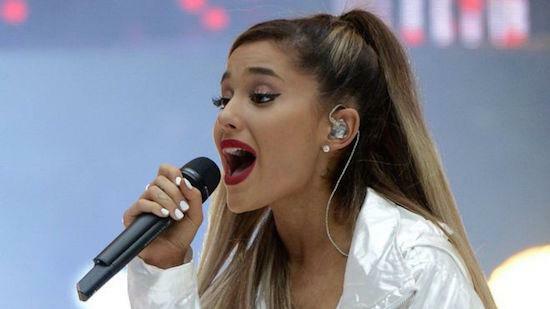 Ariana Grande has announced details of a benefit concert in Manchester to take place less than two weeks after a terrorist attack at Manchester Arena following a show she had just finished at the venue. The benefit concert will take place at Emirates Old Trafford in Manchester, with Grande set to be joined by the likes of Coldplay, Pharrell Williams, Justin Bieber, Miley Cyrus, Katy Perry, Take That, Usher and Niall Horan at the concert. All net ticket proceeds from the show will go towards the 'We Love Manchester Emergency Fund' set up to raise money for those affected by the terrorist attack which killed 22 people and injured many more. The concert will take place this Sunday (June 4) with general admission tickets going on sale on Thursday (June 1). The concert will be broadcast on BBC television and radio, with Grande offering fans who were at last Monday's show the chance to claim a free ticket to the benefit concert. Writing in an open letter posted via her social media accounts, Grande said: "My heart, prayers and condolences are with the victims of the Manchester Attack and their loved ones. There is nothing I or anyone can do to take away the pain you are feeling or to make this better. However, I extend my hand and heart and everything I possibly can give to you and yours, should you want or need my help in any way. "We will not quit or operate in fear. We won’t let this divide us. We won’t let hate win… Our response to this violence must be to come closer together, to help each other, to love more, to sing louder and to live more kindly and generously than we did before. "Music is meant to heal us, to bring us together, to make us happy. So that is what it will continue to do for us. We will continue to honour the ones we lost, their loved ones, my fans and all affected by this tragedy. They will be on my mind and in my heart everyday and I will think of them with everything I do for the rest of my life."